As of August 6, 2012, we no longer provide technical support over phone, email, and chat for all KiSS branded and DMA-series models (DMA2100 and DMA2200), as these products have been discontinued from sales and engineering. Go to the Linksys Support Site and choose your region by clicking on the link at the top-right corner of the page. Then, select your location and language. NOTE: In this example, United States English is selected. Click on the Support section at the top. Enter your device’s model number in the Start Here field and press [Enter]. QUICK TIP: If you do not know the model number of your device, click the Where’s my model number? link to learn how to find it. You will then be directed to your device’s product support page. Click the Downloads tab. Click the drop-down arrow and select your device’s Hardware Version number. 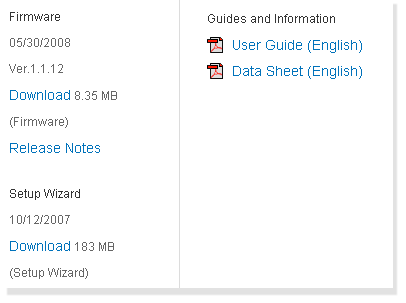 All the specific version number’s downloadable items will be displayed. You will then be shown with specific forum topics about your device. 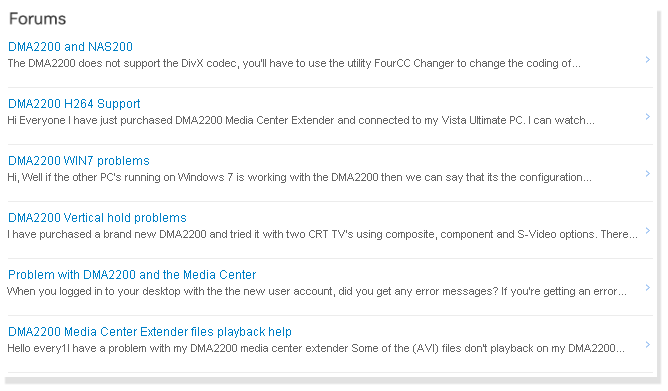 NOTE: In this example, DMA2200 is used. Alternatively, you may also go to the Community Forums to find help and support for KiSS and DMA-series products from the users’ community.